The last time I bought a new watch was probably 2008 or 2009. It was a self-winding mechanical watch with exposed gears that was absolutely beautiful; unfortunately it stopped keeping time in 2010. I received another watch that Christmas, which I wore for a few months, but after that I stopped; after all, why wear a watch when we’re constantly surrounded by clocks? So I’ve been watchless for five years. One thing I’ve considered for a few years now is a smartwatch, but they haven’t seemed to have enough capability to be worth the money. After reading John Sonmez’s review of the Apple Watch, however, it seemed like it might be worth the investment (particularly when it’s on sale) and my wife picked one up for my birthday present this year. I’ve now been wearing it for about five days, and thought I’d put down my first impressions. 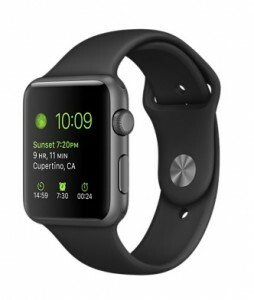 First things first: I chose the black (Apple calls it Space Gray) 42mm sport watch. 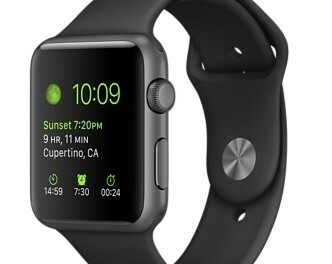 This is the second least expensive one (the 38mm sport watch is $50 cheaper); Apple just cut the price to $349 from $399 (along with introducing a number of new bands), but it goes on sale for $299 fairly regularly. The watches all have the same functionality, but depending on which case and band you want, you can spend up to $17,000. The watch band is a bit odd, but I got used to it pretty quickly. It’s not easy to describe, but it seems to work. Charging is simple – just put the watch on the magnetic inductive charging station and you’re good to go – and pretty quick – I’ve mostly been charging the watch for about an hour a day. Ok, enough of the basics – why am I willing to spend hundreds of dollars on a fancy watch that needs to be charged regularly? There are, so far as I’ve seen, no “gee-whiz”, astounding apps that make the watch a must have. What it does have is a lot of little conveniences that make your life that much easier. For me, most of them break down into two categories: work and travel. Like probably most of the people reading this blog, I use a smartphone (obviously, an iPhone) and I get a lot of notifications. At work I’d started leaving my phone on my desk to that I can see why it’s vibrating rather than pulling it out of my pocket; if someone’s calling me, I try to Google the number quickly on the off-chance that it’s someone I’d want to talk to (it almost never is – most of these searches show it’s a scammer calling). Now I leave my phone in my pocket and take a quick look at my watch to see if it’s anything I need to deal with. When I’m out of my office, meeting details come up on my watch so that, again, I don’t have to pull out my phone to see where I’m supposed to be next. It’s not a big deal – is taking your phone out of your pocket really all that difficult? – but it removes a minor irritation. A year ago, I took up listening to audiobooks on my commute; unfortunately, sometimes I miss something, and even if I’m stopped at a light I can’t really pull my phone out and rewind. Now I have the Audible app, so I can just hit the rewind button without taking my eyes off the road. That’s useful. Ok, how about non-commuting travel, to new cities? This was actually my justification for getting the watch, as I travel within the US for business and will be visiting London and Paris next month. This past weekend, I tried out the watch features on a trip to Chicago. 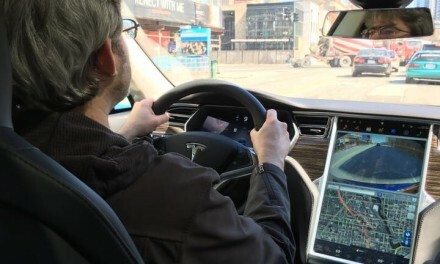 When I’m driving someplace unfamiliar, I always use my phone for directions, but I don’t always hear the street name (actually, I usually don’t). Now I can just glance at my watch to see what the next street is and how long until I need to turn; it also vibrates when I reach the turn. This isn’t perfect – the watch is sometimes a bit slow to update after a turn and this seems to drain the battery – but it’s pretty helpful. The same functionality also works with walking; you can be walking around the city and get your directions without having to take your phone out (and become a target for pickpockets). I used this when walking a few places in Chicago, and I’m looking forward to using it again when riding the tube in London. I mentioned battery life – aside from the drive to Chicago, I don’t seem to go through battery that quickly. The last few days I’ve slept with my watch on and used the alarm to wake up, then charged the watch for an hour before leaving for work. So far, so good. Since I’m completely deaf when I’m not wearing the processor for my cochlear implant I normally have to carry a vibrating alarm clock when I travel; as you might imagine, this both takes up space and slows down getting through airport security. If the watch keeps waking me up successfully, I’ll no longer need to carry a clock when I travel; I’ll just have to make sure the watch is sufficiently charged before I go to bed! One thing I should mention that’s pretty cool: in order to save battery, the display is only on when you’re “looking” at it – by which I mean, you have your arm rotated such that the watch face is where you can see it. This isn’t perfect – I have to occasionally wake it up – but it works pretty well and it’s a cool feature. Something I haven’t tried yet is Apple Pay on the watch – I’ve barely used it on my phone, even – but not having to take my wallet out seems like a good thing. We’ll see how that works out. I don’t love everything about the watch; for example, I still haven’t managed to get Siri to work (it activates, but then doesn’t seem to process that I’m talking). Even with the price cut, it’s still pretty expensive. I was used to winding my mechanical watch each day in case it didn’t self-wind enough, so the need to charge the watch isn’t a big deal to me, but it’s still something else to remember. Are smartwatches, at this point, still overpriced toys? Yes, they are. Do you need to run out and buy one? No, not at all. But if you have a smartphone that supports it (iPhone 5 or later), it’s a pretty nifty gadget that removes a few of the little annoyances of day-to-day life.